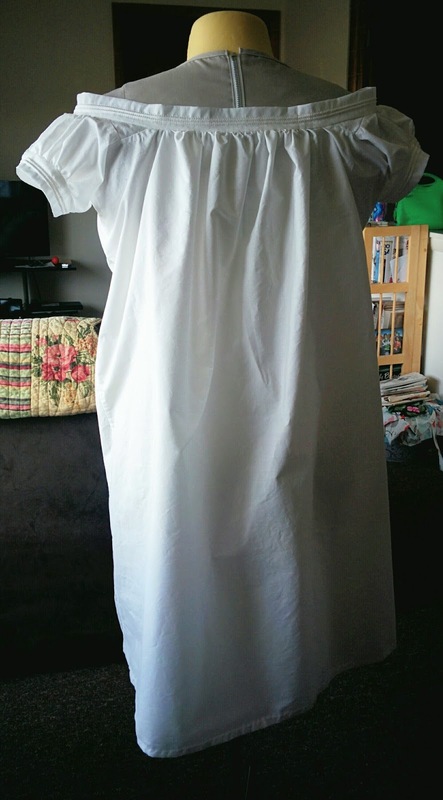 For the "Protection" challenge, I made a chemise to wear for the Civil War Weekend. Chemises, of course, protect your skin from the corset, and your corset (and other clothes) from your skin, and so are a perfect thing to make as an example of a protective garment. This is the pattern I used, which I took while working at the Chapman Historical Museum. It would be a very good one for a first attempt at scaling up a pattern - I strongly recommend it if you have any interest in practicing that skill. That said, the actual making is tricky. There's a lot of gathering, and since the original had the bands attached by machine I didn't do stroked gathers, which are in a way simpler and hang better. I really should have used a smaller cording (the original has five rows) and should have started it much closer to the fold, so as to have more room for the seam allowances. I had to trim them quite close. Setting in the neckline gussets was also a tricky annoyance. Fabric/Materials: White Pimatex cotton from Dharma Trading Co. at $6.79/yd. Pattern: Posted here on my blog some time ago. Year: Probably 1860s or 1870s? I never quite decided with the original, as it has such unique conclusion. Probably later 1860s. Notions: I used some Sugar'n'Cream yarn for the cording. How historically accurate is it? Extremely! I hand-sewed where the original was hand-sewn and machine-sewed where the original was machine-sewn. I didn't include the eyelet insertion because the eyelet on the original was made by handmachine, and I can't get my hands on any of that but am also unwilling to make it by hand (way too much effort for a couple of inches of embroidery on each sleeve) or use modern eyelet (modern!). That said, I did make one side on the fold instead of seamed, because why not, really. Hours to complete: I really meant to pay attention this time, but completely forgot about it. (To be) first worn: July 30-31, Civil War Weekend. Total cost: About two yards of cotton, so $13.58. Nice job! The stitches in the closeup are so tidy. Oooh, pretty! Very nice stitching! 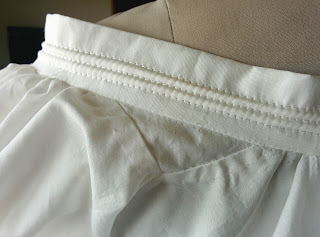 I don't think it's very common - the one I based it off is the only extant chemise I've ever seen that had that detail. Hopefully it's as nifty to wear as it is to look at!